Achieve intense, dramatic lash in a single stroke. Less, thin or downward lashes completely transform into extra thick, plentiful lashes. Brush specially designed with bristles of specific length and elasticity. The uniquely angled curve achieves quick volumizing effect. Composed of longest-ever fiber introduced from DASODA. 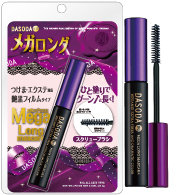 Provides beautiful extension as it gradually reaches the tip of the lashes. 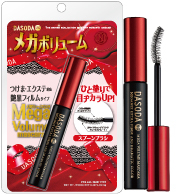 Short, thin and downward lashes change into extraordinary long flexible lashes. The 'Separate Formula' separates the lashes delightfully while adding more length. resulting delicate and amazingly long lashes. without penetrating the skin which prevents pigmentation. Quickly blends into facial cleansers and easily washes off. eyelids. Easily draw thick bold lines in layers without smearing. A versatile brush specially designed with bristles of specific length and elasticity. Each bristle is built with specific angles to obtain maximum smoothness. 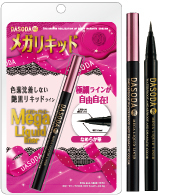 Allows the ink to adhere to bristles and create dark bold lines instantly. Copyright (C)2014 Cosmedic Ai Co., LTD. All Rights Reserved.